No splashing. 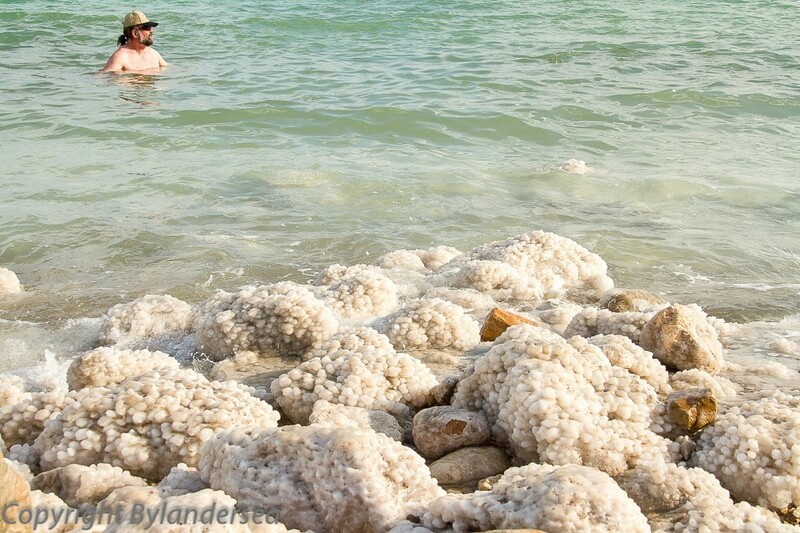 That’s the first rule when you immerse yourself in Dead Sea. Even a tiny drop in your eyes or mouth burns fiercely. I wasn’t worried; it was January and I’m a Floridian. Call me wimpy, but I don’t swim outside when the temperature hovers around 40 degrees. Nonetheless, some do. 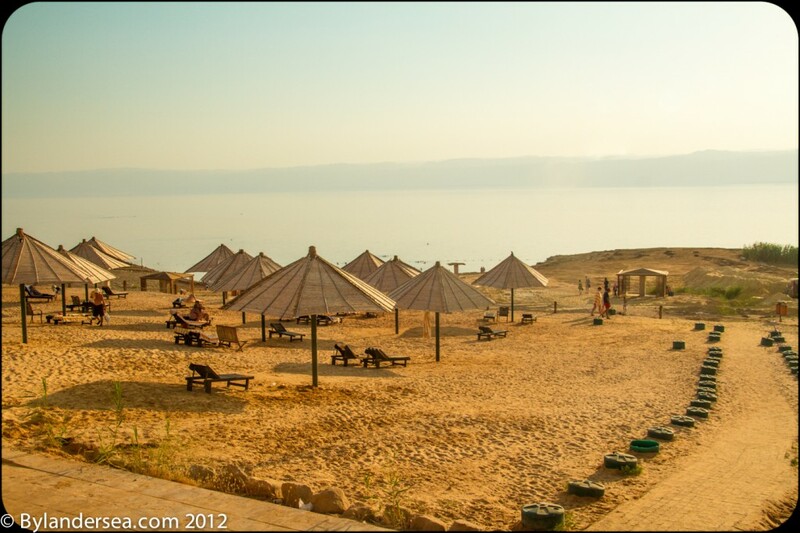 Israel’s Dead Sea isn’t really a sea; it’s a lake in the Negev desert, about 1,300 feet below sea level. That makes it the lowest point on Earth that’s not under water. 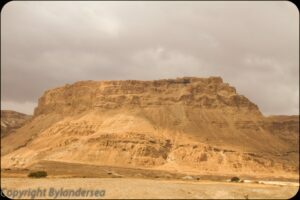 My first glimpse of the glass-like expanse came from Highway 90 (the world’s lowest road) as we drove beyond the Judean Mountains toward Masada. The water looked oddly colored through my camera viewfinder. In some places it appeared neon green and in others, electric blue. Undoubtedly, the water’s mineral content contributes to this psychedelic effect. 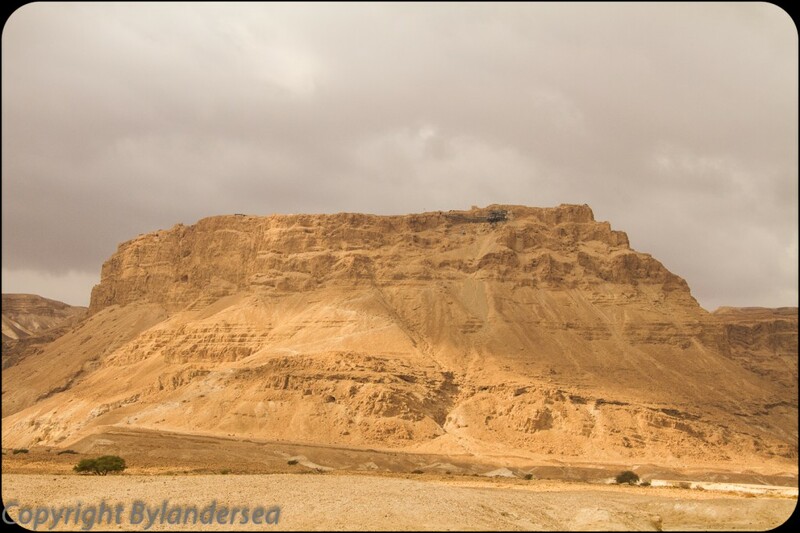 The bus drove on to the UNESCO World Heritage site, Masada, the ancient mountain top palace-fortress of Herod the Great. Back in 70 A.D. Jews fleeing persecution in Jerusalem joined fellow refugees there. The Romans made violent organized charges and attempted to takeover, but the Jews held out for two years. In the end, they chose suicide rather than be conquered. 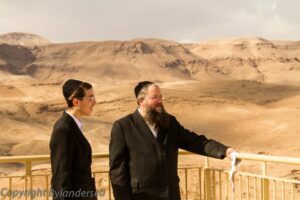 The site is considered a Jewish cultural icon. 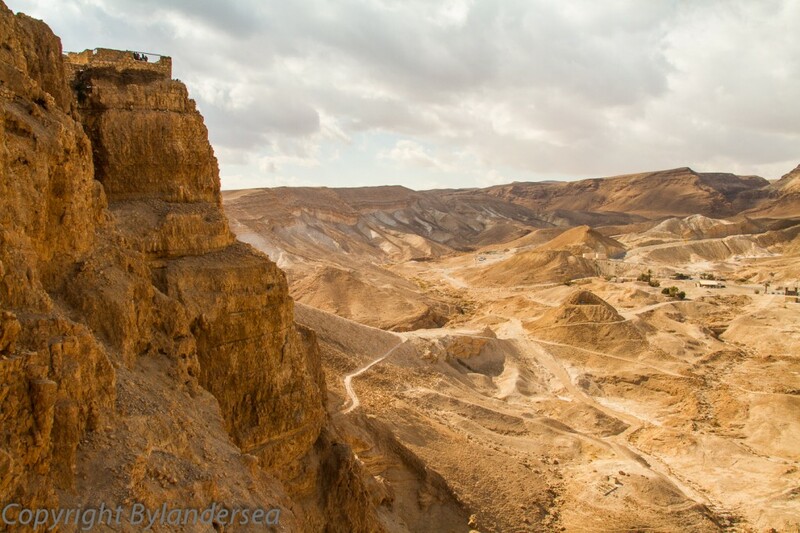 Tourists enter the rather posh Masada Visitor Center and either hike or ride a cable car to the dramatic summit. (Watch the short introductory film first as it helps understanding.) Rising nearly 1,500 feet above the Dead Sea, the hazy views from the plateau seem endless and the 2,000-year-old ruins are impressive and well preserved. Stroll among some original enclosures and other areas and lookouts that have been restored. On the ride back to Tel Aviv, my group stopped at a seaside resort. Only a few hardy folk felt like a dip, but everyone wanted to see the salty sea up close. As I walked along the near empty beachfront, I passed crusty edges at the shoreline rimmed in white. These salt deposits were created when the water hit the shore and dried in the sun. The Negev gets about 330 sunny days a year, but this day was not one of them. 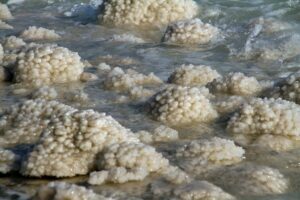 Nothing grows in the Dead Sea (hence the name) because the salinity is 8.6 times saltier than the ocean. The mineral content ranges around 30 percent compared to 3.5 percent in the Mediterranean. That’s known as heavy water with high viscosity (love that wonderful word I learned in Anatomy and Physiology 101). The surface air is also heavy from mineral compounds in the evaporating water. 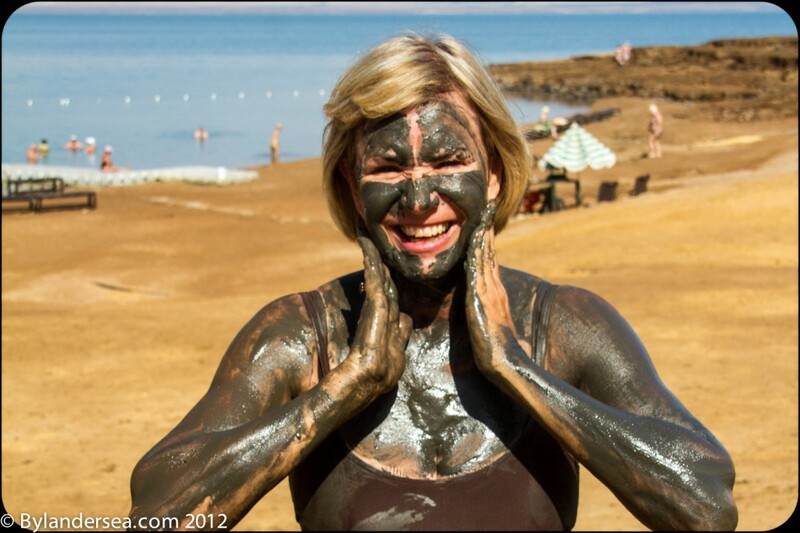 The area’s dark mud or clay is believed to have therapeutic qualities, along with a soak in the briny liquid. The usual procedure is to apply thick mud all over your skin and let it dry for 10 minutes. Then, slowly walk into the water and float on your back. Swimming is not a good idea because it creates a splash. No more than 20 minutes is recommended or you’ll become dehydrated. I didn’t partake the treatment on my January trip to Israel, but as luck goes, I made a visit to Jordan five months later. (Jordan is clearly visible from Israel, on the opposite side of the bank.) In May, I whole-heartedly caked my arms, legs and face with mud, chuckled at myself and then sat and baked in the sun. Laughing at yourself is part of the therapy. Feeling rather prune-like, I slithered off the edge of a low platform into the water. I could barely keep my feet down. They wanted to pop up, honestly demanded it, and so, I let them. Floating on my back took no effort because of the buoyant properties of the salt water. As a swimmer, the sensation was strangely different, laughably fun and totally liberating. While in the water, I rubbed the mud off my skin, which then felt rather slimy, but in a good way. My hands slid over my skin as if gliding over waxed paper. When I came out of the Sea, I could have recorded a commercial for baby soft skin. The experience brought to mind a costly spa treatment, but a free one you give yourself. Some medical experts say a dip helps those suffering with psoriasis and arthritis. Whether curative or not, who cares? 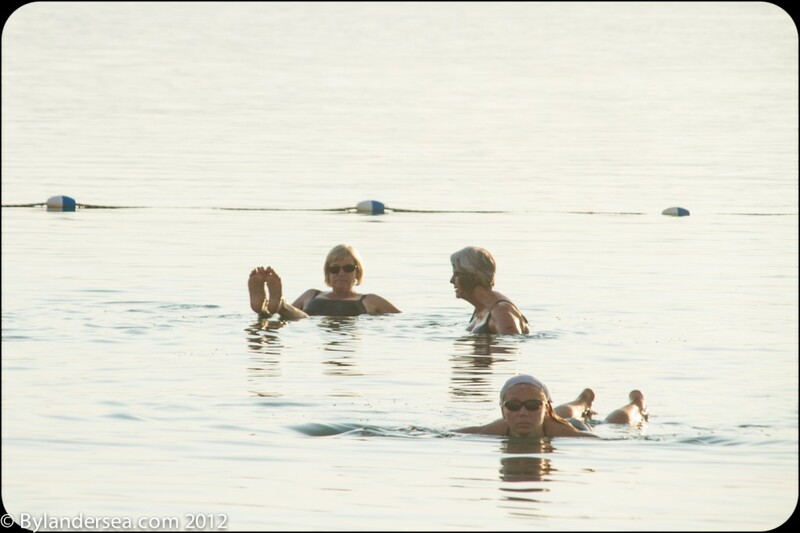 I came alive in the Dead Sea.